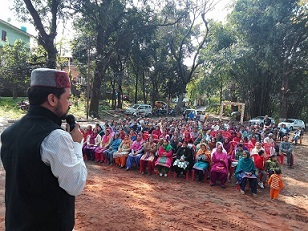 In its one day maiden visit to Dharampur and Sandhole on 24th Jan 2019, Chief Minister Shri Jairam Thakur announced lots of schemes. Addressing public he said HRTC sub-depot would be opened at Sandhol, a mega scheme of Rs 121.50 crores to resolve water issues. He laid foundation stones for mini secretariat, ITI bhawan, bridge on Mosat khand on kothowan – chontra link road, bridge on Tiral nala on Deyol – Lehsani road, sericulture and Civil hospital in Sandhol. He also inaugurated drinking water schemed for villages Deyol, Koon, Balyali constructed at cost of Rs75.12 lakh. Local MLA and IPH Thakur Mahendra Singh welcomed and thanked CM for various initiatives and development programmes being taken in Dharampur constituency. CM was accompanied by MP Shri Anurag Thakur, state cabinet ministers Shri Anil Sharma, Vipin Parmar and MLA’s Col Inder Singh, Vinod Kumar, Inder Singh Gandhi, Jawahar Thakur and Prakash Rana. 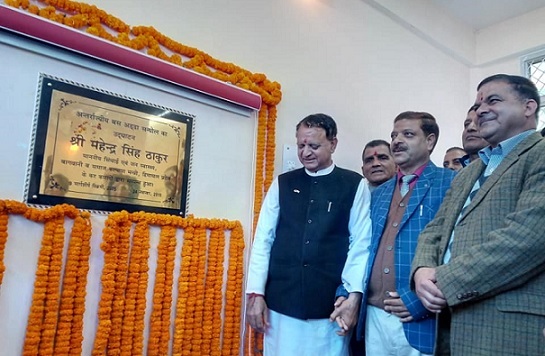 Thakur Mahender Singh, Irrigation & Public Health, Horticulture, Sainik Welfare minister of Himachal Pradesh inaugurated Bus stand ‘Sandhol‘ and laid the foundation stone for the Sericulture Bhawan and Lift water scheme on 24.11.2018 at Sandhol in Dharampur constituency. On this occasion minister laid found stone for Providing Lift Irrigation scheme for group of 5 panchyats Sandhole, Sohar, Neri, Dattwar and Ghanala, This will cost Rs1924.51 lakhs and will benefit 11 villages in these panchyats. India is largest consumer of raw silk and having a Sericulture building and centre in area encourage farmers to take sericulture on large scale. It will provide support for rearing houses, modern rearing equipments and technique helping better returns for farmers. He also started a bus service to Nalagarh, Parwanoo. 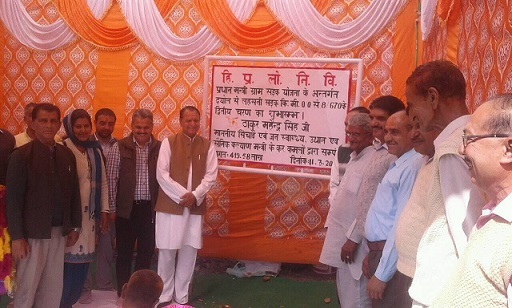 This will help the people of Dharampur and Sandhole who are working in industrial hub of Himachal Pradesh. Though some people expressed view that route should be revised to make best use of time else bus will be found less taker from this area. Addressing the public gathering, he said, He and BJP govt is committed for the development of Sandhole and state. 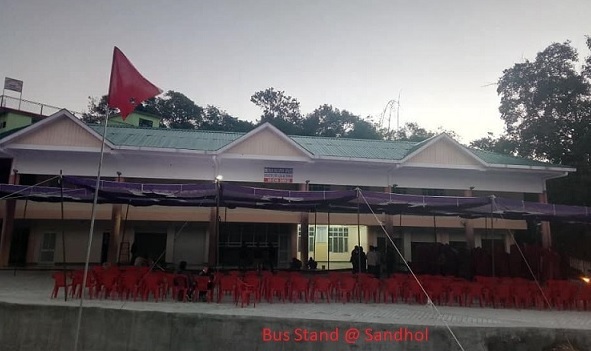 Finally the day has arrived when Sandhole will have its Bus stand. This will be inaugurated by IPH minister and local MLA Shri Mahendra Singh Thakur on 24th November 2018. The modern bus stand has its own building, all amenities, booking office, passengers waiting area, toilets apart from others. This is located on the outskirts of Hatnala bazzar. The construction of this bus stand started many years back but because of political apathy project hanged in limbo. Earlier bus used to stand in Khand at Basantpur camp with lack of facilities Every year area was being reduced and now big bus struggle to find space to park or take u turn. There was no rest room, seating arrangements for commuters, hope with new facility coming all hardship faced by commuters will go away. 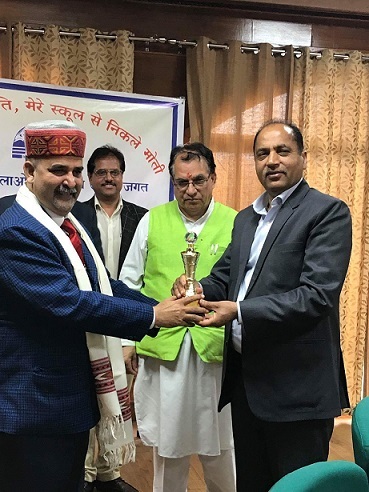 Chief Minister Jai Ram Thakur on Wednesday 10th Oct 2018 facilitated dignitaries who have studies from the schools of the state and are now holding high positions in the corporate world in a function held at Hotel Holiday Home Shimla. Awardees include Dr OP Singh, Chairman of Panchkula Educational association. Dr OP Singh belongs to village Kaltri of Sandhole and has been working in the field of education for last 25 years. He and his association provide free coaching for students of Himachal Pradesh for competitive examinations specially NEET / Medical entrances. These students are selected via conducting screening round in various Govt schools. Dr Singh runs various schemes and crash courses for promotion of medical education for rural students throughout the year. Congratulation to Dr OP Singh for getting this award and thanks for the great work being done. Sandhole is proud of you. 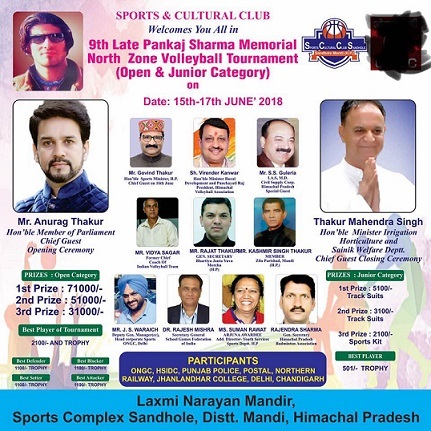 9th edition of Pankaj memorial volleyball tournament 2018 will be organised between 15th to 17th June at Laxmi Narayan Mandir Sports Complex, Sandhole of district Mandi. Shri Anurag Thakur honourable Member of Parliment, Hamirpur will be chief guest on during the opening ceremony. Shri Mahender Singh Thakur local MLA and hon’ble minister Irrigation Horticulture and Sainik Welfare will chief guest of closing ceremony. Lots of renowned teams and players from Himachal and neighbouring states are expected to participate in this. You can also register your team at Kuldeep Hardware Store Sandole, Contact No 9459054822. 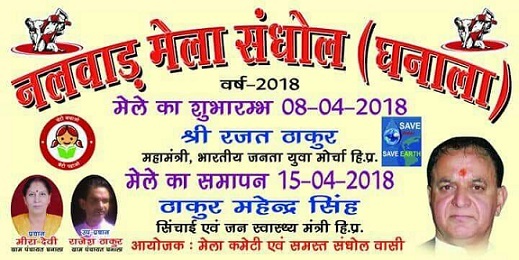 नलवाड मेला संधोल (8 अप्रैल से 15 अप्रैल 2018) जो कई दशकोँ से संधोल को एक विशिष्ट पहचान दिलाता आया है लेकिन आज यही मेला अपने अस्तित्व की लड़ाई लड़ रहा है l तो क्यों न हम सब संधोलवासी मिलजुल के थोड़ा थोड़ा योगदान दें और अपनी इस धरोवर को सहेज के रखें l क्योंकि बिना Fund के किसी भी प्रकार का आयोजन करना थोड़ा मुश्किल हो जाता है l अत: सभी संधोलवासियों से नलवाड मेला कमेटी का निवेदन है की इस आयोजन में सहयोग दें खास कर वो लोग भी इस पर गौर करें जो अपने संधोल से दूर रह रहे हैं क्योंकि आप में से जो लोग वितिय रुप से मजबूत स्थिती में हैँ वो कृप्या ज़रूर योगदान दें l इस हेतु आप मेला कमेटी उपाध्यक्ष श्री राजेश कुमार जी से सम्पर्क कर सकते हैं l मोबाइल नम्बर – 98163-52840. 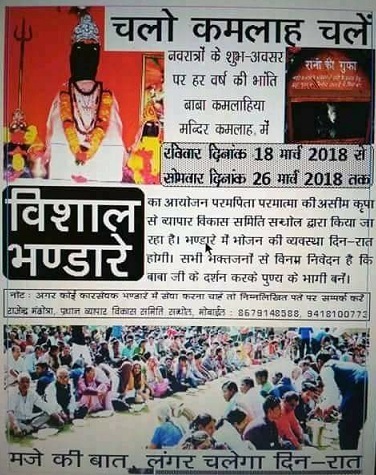 On the occasion of chaitra navratri, Sandhole Vyapar Vikas Samiti is organising a vishal bhandara at Baba Kamlah Fort, 8 km from Sandhole from Sunday 18th March 2018 to Sunday 26th March 2018. Food will be served day & night on all days. The bhandra – food as a worship offering to celebrate chaitra navrati and seek blessing of maa. Everyone is requested to come, eat and seek blessing of baba ji. If you are interested to do any service, Please contact Rajender Mandhotra, President Vyapar Vikas Simiti Sandhole. 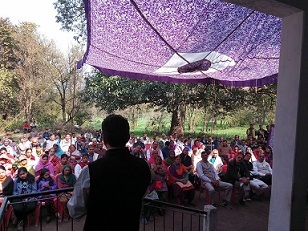 Local MLA and honorable IPH minister of Himachal Pradesh, Shri Mahender Sigh Thakur during its visit to various villages of Sandhole Tehsil announced road map of various link roads under Pradhan Mantri Gram Yogana. He laid down the foundation ceremony of second phase of road between Deyol to Lahsani to be build at the cost of 419.58 lakhs. During his visit also announced and sanctioned funds for Gowalla Link road, Cheej link road and other key initiatives. 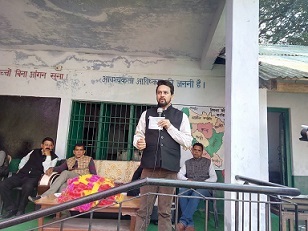 In public connect programme Anurag Thakur, MP Hamirpur visited Sandhole on 25th Feb 2018 and addressed the public in four gram Panchayats. He started his day with meeting at Ghanala. Mr Thakur informed that he has given 2 crore and 25 lakhs from his MP kitty to Dharampur assembly constituency for various development works but was surprised to see that nowhere he could find any board displaying this information. He directed concerned officers and public representatives to display this information within 15 days. 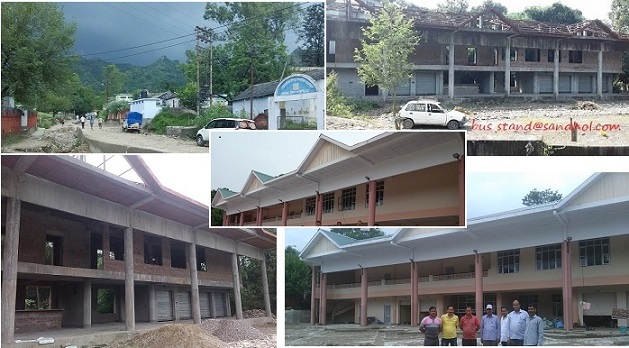 He also promised that foundation stone and construction of Kendriya Vidyalaya campus will be done very soon. He gave 3 lakh to build community centre at Ghanala and instructed to start construction in 15 days. Later in the afternoon he addressed public at Govt Primary School Dattwar followed by Torekholla and Koon. This bus will also make use of Harsipattan bridge, which was opened for public few years ago but didn’t see being used to its full potential and connecting two districts.